Yves here. While the specific observations in this post will be very familiar to readers (you’ve said the same things in comments! ), I beg to differ with calling the Government’s Brexit negotiating stance a strategy. It’s bad habit plus lack of preparation and analysis. And the UK’s lack of calculation and self-awareness about how it is operating means it will be unable to change course. But is this the best strategy for advancing British interests? Here is the argument based on the findings of a recent Dahrendorf Forum working paper. 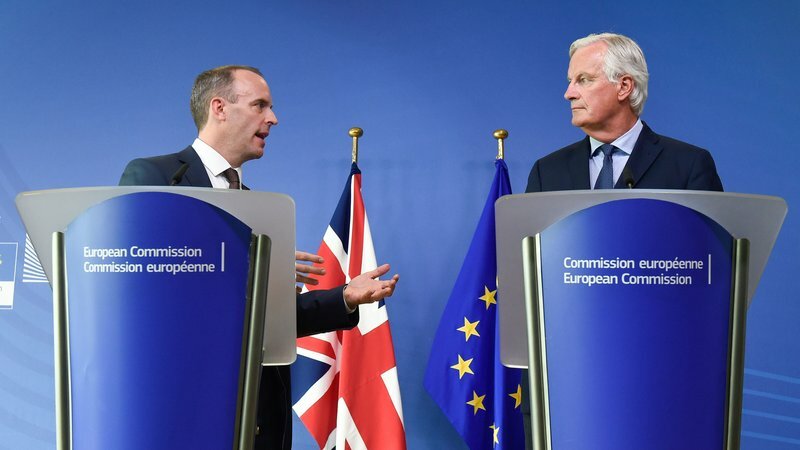 The arguments in this blog are based on the findings of a Dahrendorf Forum working paper by Benjamin Martill and Uta Staiger titled ‘Cultures of Negotiation: Explaining Britain’s Hard Bargaining in the Brexit Negotiations‘. This entry was posted in Banana republic, Brexit, Europe, Politics, UK on September 20, 2018 by Yves Smith. I tend to agree that there is no real strategy on the UK’s part. May resembles a broken record, where she says much the same thing over and over again, seemingly expecting a different response each time. Although Einstein said that he probably never made the claim about what insanity consists of, it is often attributed to him — doing the same thing over and over expecting different results is the very definition of insanity. How the government expects that this sort of behavior will bring desirable results is beyond me. Both UK and EU politicians are talking past each other. Neither side understands there are two key issues. Firstly, not understanding the economic effects stemming from the failure to understand how money is created and how it can be manipulated for global trading advantage. Secondly, that the UK is high up the list for “cultural tightness” and the reasons for this. The other element of course of a negotiation is getting potential allies to roll up behind you. At the start of this the UK had a series of potential ‘friends’ it could call on – eurosceptics governments in Eastern Europe, close historic friends and political like minded governments in Spain, the Netherlands, Denmark and Ireland. And of course non-EU countries like India or the US with historic links. They somehow managed to anger or frustrate nearly all of those though its heavy handed negotiations or laughable lack of political empathy. The source said there was “an open exchange of views” between both sides, with the Irish delegation emphasising that the time was short and “we need to get to the stage where we can consider a legal text” on the backstop. “an open exchange of views” Which is a diplomat’s way of saying that there was a shouting match and no agreement. I imagine it as being a little like this (not work safe if you have audio on). Mercy! I will save and share this. Thank you, Pu-kun. The British cited the EU’s inability to conclude a free-trade agreement with India as one example of the EU’s failings a revitalized Global Britain would no longer be shackled by. That’s quite rich considering the FTA was torpedoed when the British Home Secretary vetoed increased visas for the Indians. Her name was… Theresa May. Half the Danes are fed up with the whole thing and the other half would be egging on a hard Brexit if only they could – knowing it will likely take out at least some of the worst and most overleveraged (and gorged with tax-paid subsidies) Anti-Environmentalist Danish industrial farmers, their bankers too. And diminish the power of their lobbyists: “Landbrug & Fødevarer”! The good part is that: the British and the Danish governments have managed to make “being ruled by faceless bureaucrats in Brussels” look like a pretty much OK & decent deal, considering the alternative options: Being ruled by our local crazies, straight-up nutters and odious nincompoops (a word i like), half of whom, to top it up, are probably mere soulless proxies for those ghouls that are running Washington DC. Because human stupidity is infinite. It seems more and more to me, that never ending class warfare, and its current emphasis on austerity, leaves us unable to envision alternate routes to economic health. The neo-liberal consensus mandates that our ruling class never questions its own tactics, ie dog-whistle racism to distract and divide the lower classes to enable all the looting. So on both sides of the Atlantic, the rulers of English speakers stir up resentment amongst those at the bottom in order to secure votes, and maintain power, while never intending to follow through on promises to provide tangible material benefits to their constituents. The looting goes on, the trail of broken promises grows longer, and the misery deepens. The issue being ignored is that the folks at the bottom have reached the limit of their ability to maintain life and limb in the face of downward economic pressure. We’ve finally reached the end game, we in America have been driven to Trumpism, and in Britain they’ve been driven to Brexit by the clueless efforts of pols to maintain power in the face of electorates who have decided they have had enough, and will absolutely not take the SOS anymore. So we have the nonsensical situation of pols on both sides of the Atlantic flirting with economic collapse, and even civil war rather than moderate their irrational fixation on making the insanely rich even richer. In both cases we have a cast of alternating villains robbing and beating us while waving flags and loudly complaining that we aren’t showing the proper level of enthusiasm. Why no one, especially the punditocracy seems to realize this, is astonishing. I also cannot believe the Old Gray Lady killing millions of trees in its shrill efforts to prove the Russians cost Hilary the election and nary a word about how totally fed up and voiceless (with the exception of a single presidential vote) are those in the Great Flyover. Also find it amazing that the Beeb with rudimentary linguistic forensic analysis identified Mike Pence as almost certainly the author of the scathing anti-Trump memo the NYT published anonymously, without a single mention of this now widely-known fact. The problem is that brexiteers, almost to a man, thinks that the EU and the UK are equals. That’s what determines UK negotiating strategy, the ones who don’t want to play hardball can’t see the point in leaving, and the ones who wan’t to leave, can’t see the point of negotiating. On a related note, while this was about the tactics of leaving, there has been some movement on the end state front, though not by the UK. Rather it seems that the EU has made up it’s mind, and in my mind definitively scrapped the EEA option. “Brexit is the choice of the British people… pushed by those who predicted easy solutions. Those people are liars. They left the next day so they didn’t have to manage it,” Macron said on Thursday, vowing to “never” accept any Brexit deal, which would put the EU’s integrity at risk. I think the bridges have been burned, now it’s surrender or revocation that’s left to the UK, or stepping off the cliff edge. The Irish Border, assuming it remains open, is a massive concession and likely to lead to future problems as other EU nations try to have open borders or trade with their pet countries. Brits on the Continent are worried about many things ranging from driver’s licenses to residency visas! Not every Brit wants to live on that damp little island! Some like the sun and Continental cuisine. Is the EU a Great Idea to be Protected and Advanced, one that will inexorably result in ever greater benefits for the common people of the fainting nations that have been cat-herded into submitting to the “political union” that many very personally interested parties are always working toward? Like NATO is a Great Idea, not just a mechanism for global mischief and chaos? NATO gives “warfighters” a place to sit and play their games. Brussels gives “rules,” at least some of which are sort of for public benefit, until the regulatory capturers work their magic. Profit and impunity, always for the few. Maybe the 14th Century was not so very horrible after all? If one looks in “A Distant Mirror” at it, given where humanity seems to be, on the increasingly fleshed-out timeline of collapse? NATO was created to make war. The EU was created to make peace and prosperity. Comparing one to the other is unjust. The EU is not some sacrosanct construct that must be worshiped, but it has brought peace to Europe for the longest period since Pax Romana (and that was not entirely peaceful). It has also promoted trade and prosperity. Europe has been even farther ahead of economic and regulatory integration than the US (phones and credit cards come to mind). Free movement of labor and travel have dropped costs for businesses and individuals immensely. Now, whether or not human foibles enter into it is really another discussion. Is Brussels at times a giant Interest Machine and Bureaucratic Nightmare? Yes, but that is the negative face we see portrayed by anti-Europeans like the Brexiteers. The EU does a terrible job of self-promotion; citizens rarely know just how much the EU contributes to their lives. Perhaps the EU is afraid of drawing attention to itself. But the people making up the EU are not extraterrestrials; they are Europeans who make the same mistakes and commit the same fraud on a national level. Many Americans criticize Europe while vaunting their own Federation. Why should California and Alabama share a currency, a passport and a Congress? There are more differences between those states than between France and Belgium or Italy and Spain. The EU is not perfect and has costs, but measured against what it has achieved, it is a great success. The EU … has brought peace to Europe for the longest period since Pax Romana (and that was not entirely peaceful). You’re funny. The EU makes war by other means. The mortality rate for Greece is up approximately 50,000. All so Merkel in Germany, and Sarkozy and Hollande didn’t have to go before their electorates and admit they were bailing out French and German banks through the backdoor. If you want to start accounting for economic death by economic war, we can look at the US as recently as the financial crisis, though I doubt there are studies on the Homeland of this sort. Or US embargoes of vital medication and food in Iraq which led to hundreds of thousands of deaths. And so on. My point is not that the EU is perfect, but there has not been a war in Western Europe since 1945. You are welcome to spin and fiddle and search for anything you like (Gosh, all that free travel led to increases in traffic deaths! Ban the EU!). Of course, we would also need to examine what the EU has done for Europe and how many lives have been saved by improved infrastructure and exchange of information. I am not defending poor governance per se for the sake of defending the EU. But it is facile and fun to criticize it because one can make up all kinds of counter fantasies about how wonderful life would be without it. Let’s see how Great Britain does and then we can discuss this in a few years. I guess all those little Balkan unpleasantnesses, the former Czechoslovakia and Bosnia and such, are not wars — but then those are layable at the feet of NATO (that collection, as I recall it, of what, now, 29 member countries including all the Great Powers of the West) and the US imperium. The NATO establishment is about “making war,” largely now displaced to other Woggish and Hajji places where the huge number of refugees that are moving into Eurospace are coming from (as a result of the largely economically driven (oil and other extraction interests) and Israeli and Saudi-enhanced large scale destabilizing war prosecution. All of which is linked in significant ways to the economic “health” of the EU, from which lots of weapons flow in exchange for favors and money from the Destabilizers. Yes, the EU notion of reducing the conflict generators of the past seems to be a good one. But surprise! In practice, you got your German hegemon and your French strutters and now of course the British bomb throwers pointing out, along with the renascent nationalism triggered in part by the hegemon’s bleeding of other nations via Brussels and EU institutions, like Greece and Spain and Italy and so forth. And of course the warring that the seamless economies of the EU (that includes their particpation in NATO) foster and participate in that drives the exodus of mopes from the Mideast and Africa. And how about the fun and games, with possible nuclear war consequences, that are playing out with EU and NATO and of course US Imperial Interests activity in Ukraine? And I see that the Krupp Werks has delivered a bunch of warships to various places (hasn’t that happened a couple of times in the past? Thinking how particularly of Dolphin-class submarines paid for by Uncle Sucker, as in the US, and delivered to the Israel -ites who have equipped them with many nuclear-warhead cruise missiles? And thanks to the French, of course, and other Great Nations, the Israelis have nuclear weapons in the first place. It’s nice that the science parts of the EU structure are sort of working to keep US-made toxins and genetically modified crap and other bad stuff out of the Holy EU Empire. But hey, how many VW diesel vehicles on the road (thanks to some combination of corruption and incompetence on the part of the EU?) equals how much glyphosate and stacked-GM organisms barred by EU regulations? Lots of argument possible around the margins and into the core of the political economy/ies that make up the EU/NATO, and the Dead Empire across the Channel, and of course the wonderful inputs from the empire I was born into. I guess the best bet would be to program some AI device to create a value structure (to be democratically studied and voted on, somehow?) and measure all the goods and bads of the EU, according to some kind of standard of Goodness to Mope-kind? Naw, power trumps all that of course, and “interests” now very largely denominated and dominated by supranational corporations that piss on the EU when not using its institutions as a means to legitimize their looting behaviors that sure look to me like an expression of a death wish from the human species. There are always winners and losers in any human game, because at anything larger than the smallest scale, we do not appear wired to work from comity and commensalism. You sound from the little one can see of you from your comment as a person among the winners. Which is fine, all well and good, because of that “winners and losers” thing. Until either the mass vectors of human behavior strip the livability out of the biosphere, or some provocation or mischance leads to a more compendious and quicker, maybe nuclear, endpoint. Or maybe, despite the activities of the Panopticon and the various powers with forces in the polity to tamp it down, maybe there will be a Versailles moment, and “Aux Armes, Citoyens” will eventuate. I suggest you read up on your recent European history. Czechoslovakia split entirely peacefully and it had exactly zero to do with either NATO or USA. Yugoslavia had its problems ever since it was Yugoslavia in early 20th century – all Tito managed was to posptpone it, and once he was gone, it was just a question of when, and how violent it would be. Serbian apologistas like to blame NATO, conveniently ignoring any pre-existing tensions between Croats and Serbs (not to mention ex-Yugoslavian muslims). Did NATO help? No. But saying it was the cause of the Serbo-Croat war and all the Yugoslavian fallout is ignorance. What gets my goat is when someone blames everything on CIA, USA, NATO (or Russia and China for the matter), denying the small peoples any agency. Especialy when that someone tends to have about zilch understanding of the regions in question, except from a selective reading. Yep, CIA and NATO and the Illuminati (and Putin, to put it on both sides) are the all-powerful, all seing, all-capable forces. Everyone else is a puppet. Right. The period from the end of WWI to the Balkan Wars is still the longest period of peace since the Romans. I doubt you have ever lived through a war so I can’t expect you to appreciate the difference between the Horrors of the Brussels Bureaucracy and the Horrors of Shelling and Bombing. From your lofty armchair, they might be the same but then again, perhaps you blame the socialists when your caramel latte is cold. I think you missed out a ‘I’! yep, missed an “I”. Unless anyone would like to argue that WWI was just a friendly disagreement amongst friends? Lofty armchair? I actually volunteered and got the opportunity to go be a soldier in an actual war, the Vietnam one. So I have a darn good idea what War is in actuality and from unpleasant personal experience. And I don’t have either the taste or the wealth for lattes. And forgive my aging failure of typing Czech instead of Yugo — my point, too, is that the nations and sets of “peoples” living and involved in United Europe do in fact have “agency,” and that is part of the fractiousness that the proponents of a federated Europe (seemingly under mostly German lead) are working steadily at suppressing. Not as effectively as a Federalist might want, of course. TheScream wrote: I am not defending poor governance per se for the sake of defending the EU. But it is facile and fun to criticize it because one can make up all kinds of counter fantasies about how wonderful life would be without it. Wake up. I’m talking about what the European elite in the real world deliberately chose to do. They chose to do a backdoor bailout of German and French banks specifically so Merkel, Sarkozy and Hollande and the governments they led didn’t have to go to their electorates and tell them the truth. Thereby, they maintained themselves in power, and German and French wealth structures — the frickin’, frackin banks — as they were. And they did this in the real world knowing that innocent people in Greece would die in substantial numbers consequently. This is not a counterfactual. This happened. Ultimately, it’s that simple. Merkel, Sarkozy, Hollande, and whoever else among the EU elites who chose to be complicit in killing substantial numbers of people so they could maintain themselves in power are scum. They are scum. They are scum. Don’t get me started on people who defend such scum with threadbare waffle about ‘I am not defending poor governance per blah blah it is facile and fun to criticize blah blah.’ Nor interested in whataboutery about US elites, who as the main instigators of this 21st century model of finance as warfare are also scum. Fine, our elected leaders are all scum, but why does this mean that the EU is evil specifically. Why single it out? Why not advocate the overthrow of all centralized or unifying government? Move out to Montana to a cult and buy lots of guns or something. My point is not that EU leaders are charming people working exclusively for the good of the people. My point is that the EU is not as bad as most of you believe and no worse than most other governments. It is simply an easy target because it is extra or supra-national. We can get all frothy at the mouth blaming Nazis and Frogs for our woes and ignore our personal failures. I would love to insult you personally as you have insulted me, but I sense you are just ranting out of frustration. You hate the EU (are you even European or just some right-wing nutcase from America involving yourself in other’s business?) and take it out on me. Go for it. Your arguments are irrelevant and completely miss the point of my comments. The EU is, very simplistically, set up like a shared Civil Service. Civil Services are to be seen rarely and never heard, less they take shine and glamour from the Government they serve. What “Bruxelles” can do is to advise and create Directives, which are instructions to local government to create and enforce local legislation. The idea is that the legislation and enforcement will be similar in all EU member states. Ons should be very aware that EU directives comes mainly from the member states and that especially bad things that would never fly past an election could – and often is – spun by local government as “Big Bad Bruxelles is forcing poor little us to do this terrible thing to you poor people”. Ala the British on trade deal with India and immigration of east-european workers. The EU does not have that much in the way of enforcement powers, that part is down-sourced to the individual member states. When a member state doesn’t give a toss, it takes forever for some measure of sanctioning to spin up and usually it daily fines unto a misbehaving government, at the taxpayers expense (which of course those politicians who don’t give a toss, are fine with since most of their cronies are not great taxpayers anyway). Dude — black plague! 75 to 200 million dead! At a tie with a world population of 400 million, and 40 million of those may as well have been on Mars! China, ME, North Africa and Europe depopulated! Time to really reconsider one’s assumptions when one wonders whether the 14th century was “that bad”. Chequers Plan is Dead, says Tusk as Macron calls Brexiters Liars. It seems the EU leaders aren’t even pretending anymore. Its pretty clear they have run out of patience, and May has run out of options. I wonder if they’ll even bother with having the November summit. He didn’t call May a liar, so we’ll have to see how her life support algo in the Daily Mail responds to this new input. If there’s no November summit (which would make no-deal Brexit almost certainty), then the game becomes fast a and furious, as sterling will drop like a stone – with all sorts of repercussions. TBH, that can already be clear after the Tory party conference, it’s entirely possible that that one will make any October Brexit discussions entirely irrelevant. I think that EU overestimated May in terms of sensibility, and now accept that there’s no difference between May and Johnson (in fact, with Johnson or someone like that, they will get certainy, so more time to get all ducks in row. Entirely cynically, clear no-deal Brexit Johnson would be better for EU than May where one has no idea what’s going to happen). Either way, this crop of politicians will make history books. Not sure in the way they would like to though. Announced post-summit in Salzburg: no November summit absent a binding exit deal on the table by the end of October. So no: no November dealing. I don’t know that EU politicos overestimated May. She is what they had, and all they had, so they did their absolute best to prop up Rag Sack Terry as a negotiating partner, hoping that they could coax her to toddle over their red lines with enough willingness to listen to her hopeless twaddle first. She just shuffled and circled in place. So they’ve given up on her ability to deliver anything of value to them. One could see this coming in June, when she couldn’t even get the sound of one hand clapping to her chipper nonsense over dinner. I think that deciding heads in Europe have accepted the probability that crashout is coming. That was clear also in June. If something better happens, I suppose that they would leap at it. Nothing in the last two years engenders any hope in that regard, so hard heads are readying the winches to hoist the drawbridge on We’re Dead to You Day. If the Tories fall, which I think and have long thought is probable, it would be up to a ‘unity government’ to either initial a settlement surrender and keep the sham going, or flinch. My bet has been on pulling together some kind of flinch mechanism on aborting exit. It’s the kind of year, as I model these, where wild swings of such kind are possible, but I couldn’t predict the outcome anymore than anyone else. My feeling for a while is that the government would never fall, whatever happened, simply because the Tories (and DUP) fear a Corbyn government too much, so would never, ever pull the trigger, no matter how bad things got. But if May falls at the Party Conference and is replaced with a hard Brexiter, I don’t think its impossible that there may be a temptation that to see if they could whip up a nationalistic mood for a snap election. Some of them are gamblers by instinct. Anything could happen then. I think Tory Remainers bolt, choosing keeping their own wallets rather than handing those over to the worst of their lot with everything else. But they would find a unity coalition more palatable than passing the microphone to Jerry the Red, yeah, so that’s a bit sticky. A snap election is the worst kind of crazy town, and wolldn’t improve negotiating or decision outcomes in the slightest—so of course that may be the likeliest near term course! Won’t get settled in a few weeks. Probably not until 20 March 2019. This is just wowsers. Tusk, Macron, and Merkel baldly state that Chequers is mated—“unacceptable”—and furthermore gave the Tories a drop-dead date of 31 October to initial the divorce settlement. The process is a flat abandonment of Theresa May, concluding the obvious, that she and her government are incapable of negotiating exit. Going over her head to Parliament and public, in fact if not in pre-consisdered intent. —And about time. I was worried that the EU would eat fudge in November with the Brits again on another pretend-to-agree accord like that of December 2017, which, as we have seen did nothing to induce the Tories to negotiate a viable outcome. What was May’s reaction? That she’s perfectly prepared to lead Britain over the crashout cliff if the EU doesn’t see fit to capitulate. I’d roll on the floor laughing but I can’t catch my breath. The next two weeks are going to be lively times in Britain indeed. I can’t see how ‘Suicide Terry’s’ government can survive this situation. —And about high time. Put the poor brute out of her misery; she’s delusional, can’t they see how she’s suffering? Push has come, so it’s time to shove. Crashout or Flinch, those are the outcomes, now plainer than ever. All May can do is thrash and fabulate, so time to bag the body and swear in another fool; lesser or greater, we shall see. Yes, I wonder was that planned, or (as is suggested in the latest Guardian article), motivated by anger at Mays criticism of Barnier? This obviously makes her very vulnerable at the party conference. Its hard to see what she can do now. She is toast I think. I can only think of two reasons that they’ve closed the door firmly in her face. Either they have simply lost patience and now accept there is nothing can be salvaged, or they have lost patience with May personally, and hope that a new leader might do a deal out of desperation. The latter seems highly unlikely – a sudden Tory challenge is more likely to bring a hardliner into power. Whichever way you look at it, things look certain to come to a head very soon now. The EU may have a hope that the UK will blink when staring into the abyss and agree to the backstop, but I don’t see how politically this a capitulation is possible, at least with the Tories in power. The solution is, patently, Tories out of power. Which I think will happen, certainly between now and 31 March 2019. Now would be better. Anyone thinking strategically in other parties in the UK (an oxymoron of a formulation, to be sure) would call for a no confidence vote the instant May’s feet are on British soil. I doubt that this is personal, but what do I know. May is a nincompoop. The other heads of state patently, and quite rightly, don’t respect her. Her presence has been useful to them only insofar as she could deliver a deal. Macron looked at his watch and the date said, non on that. Just looking at his ambitions and how he operates, I would think he wanted to go this route quite some time ago, but the ‘softly, softly’ set such as the Dutch and Merkel wouldn’t back that, and he was too smart to break ranks alone. That the Germans have given up on May is all one really needs to know. This was May’s no confidence vote by the European Council, and she lost it over lunch. I’d agree with your analysis of what happened – just glancing through the news today it seems that Macron in particular just lost patience, and the other leaders were happy to help him put the boot in. The EU has been trying to shore May up for a long time – the December agreement was little more than an attempt to protect her from an internal heave. This is a common dynamic in the EU – however much the leaders may dislike each other, they will usually prefer the person at the seat than the potential newcomer. But I think the EU has collectively decided that May is simply incapable of delivering any type of agreement, so there is no point in mincing words. They simply don’t care any more if the Tory government collapses, or if they put Rees Mogg or Johnson in power. It makes absolutely zero difference to them. In fact, it might make it easier for the EU if the UK goes politically insane as they can then wash their hands of the problem. At this point it might actually be a blessing if that happened. There is likely to be a great deal of practical difference between a no-deal Brexit with six months of planning and preparation and a no-deal Brexit that takes everyone by surprise at the very last minute. (Yes, they will both be a nightmare, but some nightmares are worse than others). All this pretense that the other side is bluffing and will roll over at the 11th hour is starting to look like a convenient excuse for not facing reality. I don’t think either side is bluffing. Comments like “Britain desperately needs to have an honest conversation about the limits of the UK’s bargaining power” might very well be true, but they’re also irrelevant at this point. Certainly it would have been very useful if it had happened two years ago. Right now it’s time to break out the life jackets. Most Brits don’t seem capable of mentally accepting how irrelevant they actually are internationally. They are NOT a ‘power’ in any other respect than that they have nuclear weapons under their launch authority (which they are never going to use). They have no weight. The City is, really other people’s money that predominantly foreign nationals at trading desks play with, loose, steal, hide, and occasionally pay out. The UK economy isn’t of any international consequence. Brits are embedded in the international diplomatic process, in a dead language speakers kind of way, which makes them seem important. But they are not. So there was never going to be a reassessment of the weaknesses of Britain’s negotiating position, nor will there be now exactly, because most in Britain cannot get their heads around the essential premise to such a discussion, the Britain is now essentially trivial on the power scale rather than of any real consequence. The Kingdom of Saud has more real power. Turkey is a more consequential actor. Mexico has more people. &etc. If one is to accept the convictions of master bloviator Niall Ferguson and other Brexiteers, the issue is issue. Brexit is about immigration, period. The EU claims it will not bend on free movement of people, Brexiteers will not accept anything less. There was such a huge outcry when May mentioned the possibility of ‘preferential’ treatment for EU citizens back in July she threatened any further public dissent in the party would result in sackings. The EU insists there can be no trade deals, no freed movement of goods without free movement of people, for good reasons. Hard to imagine them climbing down. There’s about as many reasons why people voted Brexit as there’s different Brexits they wanted. Immigration is just one of the convenient scapegoats peddled by both sides, although for different reasons. If you want a better (but still not complete) reason, try decreasing real income. I’d like to know what those “many different reasons” are. Sovereignty? Well, that rolls off the tongue more easily than “immigration” which, leavers know, sounds a bit…racist. “Control of borders” works for leavers like Nigell, although he went on at great length about how it’s all about immigration, after talking to all the ‘real’ folks in the provinces. I don’t do other people’s homework – the unwilligness to do so tends to be a reliable indicator of not being open to aruments in the first place. My Irish/Brit family’s Own Private Brexit: the grandparents are entitled to naturalisation and voted Leave, the children are subjects/citizens and voted Remain (and almost all vote Tory), the grandchildren are compromised subjects/citizens and didn’t have a vote. Everyone’s happy to be entitled to an EU passport. The Pakistan offshoot has a less complex variation (fewer rights), but I believe their family voted Leave on balance. Life. A colleague told me today he knows of several Northern Irish Republicans who voted leave, precisely because they thought this would create constitutional havoc and lead to a united Ireland. It seems at least some people were thinking strategically…. That’s interesting. I was in Belfast last September….took the murals tour with an Irish guide (of course) and he thinks Brexit will rekindle the Troubles which he lived through in terror. Majority of the drop in real income is NOT driven by immigration. You may find it surprising, but there were times with large (relatively speaking) immigration and the real incomes going up. I don’t believe it is either, you seem to think these views are my own. I am speculating, with some basis, that a majority of leavers think so. Anti-immigration attitudes are entrenched and growing. Just the other day a teacher, no less, spouted off about how immigrants were causing crime and stealing jobs. This is in a blue city in a blue state. I was shocked. People come up with fantasy explanations when they’ve been reduced from realistic assessments to fantastic ideologies. If there’s a clear answer but you are ideologically constrained from considering it, you need to invent some answer, the nuttier the better. I think a major part of the problem is that British politicians and media seem to believe that Brexit is mainly (or exclusively) a British topic. One British politician publishes one proposal, another British politician shoots it down. With the British media reporting about it gleefully for days. Newspaper articles, opinion pieces. Without even mentioning what the EU might think about it. The EU seems to not exist in this bubble. Just remember the more than 60 “notices to stakeholders” published by the EU months ago. And freely available for reading on the Internet. I´ve read British media online for a long time now but somehow these notices never made any impact. It was only when the first British impact assessments were published (not that long ago) that British media started to report about possible problems after a no-deal Brexit. Problems / consequences that were mentioned in the EU notices months ago. It´s almost unbelievable. It looks like if something isn´t coming from London (or Westminster) then it doesn´t exist in the British media. And it´s the same with British politicians. David Davis and the back-stop deal in late 2017?. He agreed with it during the negotiations, returned home and then said that it wasn´t binding, just a letter of intent. Or Michael Gove a few days ago? Regardless of what agreement PM T. May negotiates now with the EU, a new PM can simply scrap it and negotiate a new deal? Or send government members to the EU member states to try and undermine Barnier as reported in British media? How exactly is that building trust? Have they never heard about the Internet? And that today even foreigners might read British media? Brexit supporter Jacob Rees-Mogg might be the MP for the 18th century but surely they know that today there are faster methods for messages than using pigeons? What about foreign investment in the UK? The gateway to the EU? Japanese car companies? The drop in foreign investment was reported, to be sure. But after a few days it was immediately forgotten. T. May according to British media articles apparently developed her Brexit strategy (and her red lines) together with her two closest political advisers back in late 2016 / early 2017. No cabinet meeting to discuss the strategy, no ordering of impact assessments which might have influenced the strategy (and the goals). And apparently – in my opinion – no detailed briefing on how the EU actually works. What might be realistically possible and what not. The resignation of Ivan Rogers seems to support my speculations. Plus the newspaper articles in early 2017 which mentioned that visitors to certain British government ministries were warned not to criticize Brexit or warn about negative consequences. Such warnings would result in no longer being invited to visit said ministry and minister. If they actually went through with that policy they created an echo chamber with no dissenting voices allowed. Which might explain why they had no plan to deal with the EU. British politicians apparently were supposed to negotiate Brexit among themselves. And once they had reached a (tentative) consensus the foreigners (the EU) were apparently supposed to bow down and accept the British proposal. And now when the EU hasn´t followed the script they don´t know what to do? I´m not an expert but it was pretty clear to me that the Chequers deal would never work. It was pretty obvious even when EU politicians were somewhat polite about it when T. May proposed it. It might have been a good starting point for negotiations if she had introduced it in 2017. But in July 2018? Just a few months before negotiations were supposed to be concluded? And then claiming it´s the only realistic proposal? It´s my way or the highway? Which means I never understood why the British media was treating the Chequers proposal as a serious proposal? And spending lots of time and articles discussing on how to convince the EU / the member states. I really think the EU member states have finally concluded that T. May is incapable of producing (and getting a majority in the House of Commons) for any realistic solution. Therefore helping her with statements to keep her politically alive doesn´t make sense any longer. The EU would probably really, really like a solution that gives them at least the transition period. Another 21 months to prepare for Brexit. But fudging things only get you that far…. The UK apparently never understood that it´s one thing to bend rules or fudge things to get the agreement of a member state. It´s quite another thing with a soon -to-be ex-member state. I am a German citizen, living in Germany. The (German weekly printed newspaper) Zeit Online website did have three articles about Brexit in the last few days. Which is noteworthy since they normally have 1-2 articles per month. And the comments were noteworthy too. Almost all of them now favor a hard-line approach by the EU. The UK lost a lot of sympathy and support in the last two years. Not because of the referendum result itself but because of the actions and speeches of British politicians afterwards. The UK had a rebate, opt-outs and excemptions. All because successive British governments pointed to their EU-sceptic opposition. Now the population voted for Brexit the British want a deal that gives them all (or most) of the advantages of EU membership without any of the obligations. To reduce the economic consequences of their decision. And if it means we´ll have to support Ireland, we´ll do it. The German commentators quite obviously have lost their patience with the UK. As a Scot can I point out that it is English politicians who are responsible for this mess? Yes, Nicola Sturgeon has comported herself vastly better than anyone in the Tory or Labour leadership…not that this is a high bar. This is the first article that I have seen that talks about power. The ability to influence or outright control the behavior of people. Money has power. It is needed to eat, heal and shelter in the West. But, it is never talked about. This is because it would raise inconvenient truths. The wealthy are accumulating it and everyone else in the West is losing it. The neo-liberal/neo-conservative ideologies are the foundation of this exploitation. It is the belief that markets balance and there is no society. “Greed is good. Might is right.” Plutocrats rule the west. Democracy died. There are two versions of similar corporate political parties in the USA. The little people matter not. Politicians are servants of the oligarchs. Global trade is intertwined and not redundant. What will happen will be to the benefit of the very few in power. Donald Trump is raising the price of all Chinese goods shipped into the USA and sold at Walmart and Amazon. A Brexit crash seems inevitable. their money must be cast into a financial version of Mount Doom, breaking their power once and for all. You folks in the UK need to make douchebag Brexiteers like Nigel Farrage suffer total loss of power for forcing this disaster on you. There is a huge source of wealth that UK monopolises from Treasure Islands that operate the City’s tax havens. That money goes straight back to City banks and flows into the market economy, independently of trade and commerce. It underwrites the derivatives biz that keeps the market economy afloat, paying pensions and profits and Directors’ options. Leaving the EU might have an effect but not a big one. Is that why UK seems so blithely unconcerned? The offshore wealth is certainly why the core hard Brexiters are unconcerned, because thats where they store their cash. They don’t care if the UK goes down. But in the longer term, they are under threat – within the EU the UK consistently vetoed any attempts to crack down on internal tax havens. The internal political balance of the EU is now much more firmly anti tax avoidance with the UK gone, so there would be little to stop a series of Directives choking off the Channel Island/Isle of Man option for money flows. Split Brain Syndrome: They seem think that the EU is Lucifer’s Army Incarnate and then they apparently also think at the same time, that “The Army of Darkness” once unleashed from the responsible British leadership into the hands of those per-definition also demonic French and Germans will still “play cricket” and not come after their tax-havens ASAP, like in 2020 or so. May now demanding that the EU respect Great Britain. We are back to the beginning again. May has no leverage beyond the EU wanting Britain to stay in . But if Britain goes out, then it’s out. The only way for May to get any concessions would be to offer to stay in! And even then I am not sure the EU would accept since it would simply open the way for any member to have a tantrum and demand better terms. GB should leave, wallow in their loneliness a while and then ask to come back. I suspect that the EU would reinstate them fully without the usual processes. Check back here in 24-36 months.